A strong accounting program teaches more than tax laws and financial reporting requirements. Surveys of America’s corporate sector show that executives and hiring managers are looking for college graduates who adapt well to change, communicate effectively, think critically and analytically, and interact constructively with others. 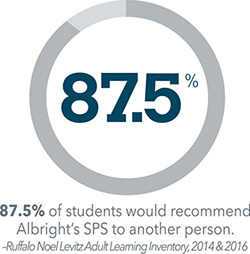 In other words, they’re looking for graduates of programs like Albright’s School of Professional Studies. In today’s competitive job market, employers are looking for more in accounting hires: more know-how, more abilities and more potential. 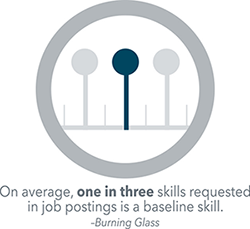 Labor market analytics company Burning Glass analyzed 1.9 million job posts to find out the top skills employers seek in their new hires. All of these skills-technical and baseline-are emphasized at Albright College. 11% projected employment growth of accountant and auditor occupations from 2014 to 2024. 142,400 new accounting and auditing jobs projected from 2014 to 2024. Albright College’s School of Professional Studies bachelor of science degree in accounting fulfills the accounting credit requirement. Students will graduate with 126 of 150 total credit hours. B.S. Mount St. Mary’s University; M.B.A. Mount St. Mary’s University; Forensic Accounting Certificate Georgetown University; C.P.A. B.S., Villanova University; M.B.A., Widener University; C.P.A. Communicate effectively at a professional level by a) reading, b) writing, and c) speaking from a pedagogical/popular level to an appropriate professional level (e.g. accounting/business-journal quality papers, research presentations). Employ strong conceptual skills for solving business/accounting problems. Know how financial information is measured and reported to external users. Show proficiency in how companies’ internal controls are evaluated for aggregation of financial information. Demonstrate an understanding of relevant professional standards and codes of conduct by recognizing the importance of ethical decision making process. Know how globalization affects organizations and their environment by identifying the impact of international financial reporting standards on the accounting profession and businesses. Proficiently use commercial software packages for projects specific to accounting and business. Identify ethical dilemmas and develop appropriate courses of action that consider the well-being of others and society. Demonstrates ability to apply tax laws to a set of data in preparation of an individual tax return and successfully utilizes tax return software to prepare an individual tax return. Demonstrate the ability to create a logical and efficient Excel spreadsheet utilizing formulas to derive results and provide analysis and effectively articulate their understanding of the results. Explain concepts and techniques from core accounting subject matter including financial accounting, managerial accounting, auditing, and professional responsibilities. Employment of accountants and auditors is projected to grow 10% percent from 2016 to 2026, faster as the average for all occupations. In general, employment growth of accountants and auditors is expected to be closely tied to the health of the overall economy. As the economy grows, these workers will continue to be needed to prepare and examine financial records.